Okay, Quiet Earthers, I know you're going to fall in love with this trailer as much as I did. 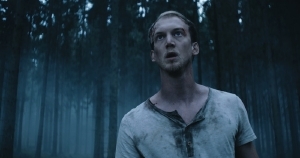 It's for a new apocalyptic alien invasion film from Sweden called a new sci-fi film from Sweden titled Den Blomstertid Nu Kommer(or "Now the time of Blossoming Arrives" translated). The gritty flick comes from director Victor Danell and was originally a crowed funded picture on some level though you wouldn't know it. At the same time as Sweden is shocked by a mysterious attack, Alex is forced back to his childhood home. There he must reconcile with his father and his youth love, Anna, while they struggle to survive. The film stars Christoffer Nordenrot, Lisa Henni, Jesper Barkselius, Pia Halvorsen, and Magnus Sundberg. Certainly looks well made. Too early to say much else, I think.